This is our reference NY-15572. 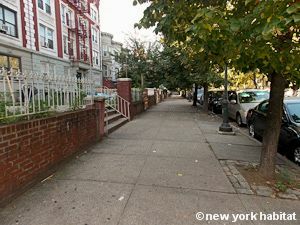 This 3 bedroom - 1 bath apartment is located on the third floor (considered the second floor by Europeans) of a 3-story walk-up brownstone building in Crown Heights, Brooklyn. 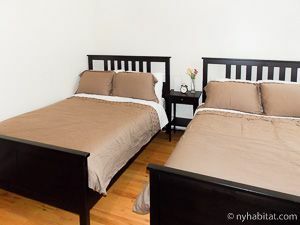 The building has a buzzer/intercom system and laundry facilities are located in the apartment itself for your convenience. 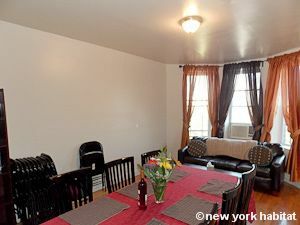 As you enter the apartment the kitchen is directly ahead of you and the living room and Bedroom #1 are off to your left. 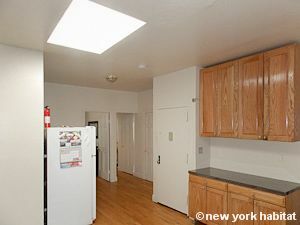 The open kitchen has a skylight which lets sun fill the space as you prepare meals. 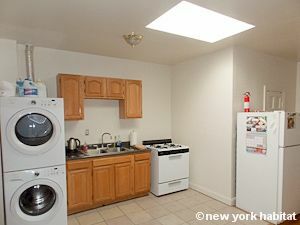 In the kitchen you will find wooden cabinets and tiled floor, a double sink, a 4 burner gas stove/oven and refrigerator. 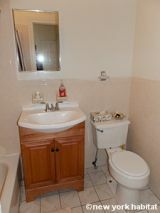 Fully equipped, there is also a coffee maker, toaster and microwave available for your use. 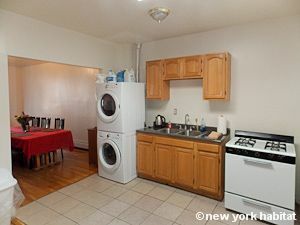 A full sized laundry washer and dryer are also found in the kitchen area so you don’t have to drag your laundry to the nearest laundromat. The living room features wooden floors and has a coffee table and leather sofa for resting after a busy day. 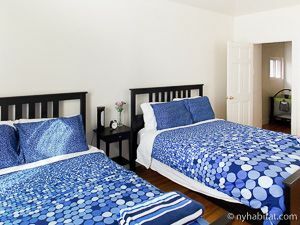 The sofa conveniently opens to a queen bed for guests. 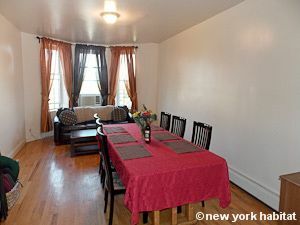 A wooden dining table in the living room area can seat at least 6 people for a home cooked meal and additional folding chairs are available to accommodate more people. 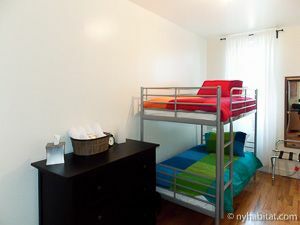 Bedroom #1 has two single sized bunk beds, a mirror and luggage rack. 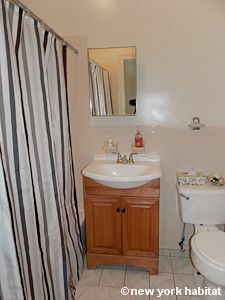 You can store your belongings in the wooden dresser or closet available. 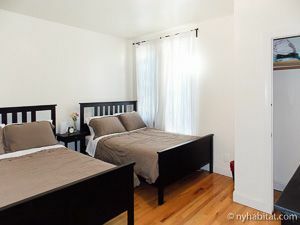 The window in this bedroom faces the tree lined street. 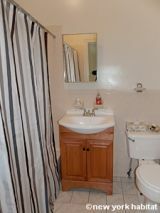 Turning to the right off the kitchen/entry area you find the bathroom as well as Bedrooms #2 & #3. The tiled bathroom has both tub and shower, porcelain sink with wooden cabinets under the sink for storing toiletries, as well as a toilet and mirror. 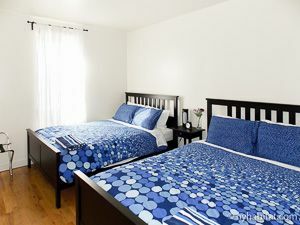 Bedroom #2 has two double size beds with dark wood bed frames and matching dresser and mirror. 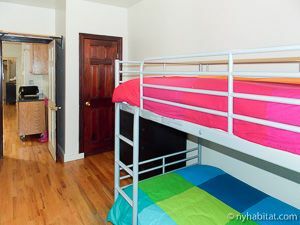 There is a closet available for additional storage space with over the door hanging hooks and a luggage rack. 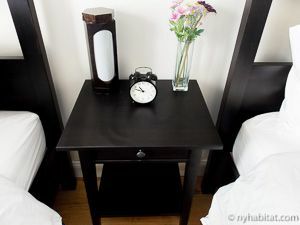 Bedroom #3 has two queen size beds with dark wooden frames and matching dresser and night table. This room overlooks the rooftops of surrounding brownstone buildings.